In the business of software development, accelerated high quality software releases in a predictable and consistent manner is a continuous target for organizations today. In a perfect world, a blend of good software development and testing practices may seem to be the perfect mix, but in reality it takes more to attain the holy grail of high-quality software delivery. 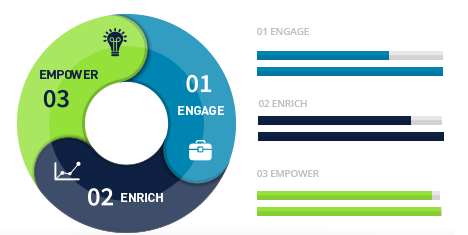 TestPoint’s client engagements typically begin with a three phased approach known as ‘Engage Enrich Empower’ (EEE™) tailored to support a client’s business objectives. “This process accelerates our learning curve, and empowers us to be more proactive to make the right decisions based on facts rather than intuition,” says Hawli. Of the three phases in implementation, the ‘Engage’ phase is designed to identify and appreciate the business challenges, risks, goals, vision, and opportunities. “We establish the strategy to monitor and measure the impact of the project delivery leading to the Enrich phase,” explains Hawli. The aim is to enrich the engagement with measurable quality assurance and real-time project visibility utilizing Vansah™ integrated across the project to deliver major productivity improvements. The ‘Empower’ phase focuses on business delivery and support, while handling project delivery. “We support the project with a scalable model encompassing resource, costs, productivity, and Intellectual Property (IP) retention,” adds Hawli. This prowess of TestPoint stems from Hawli’s love for the great Australian outdoors and his hobby of recreational fishing. “Deep sea fishing has taught me the importance of preparation, right from the crew’s efficiency to the required bait and equipment necessary to land the perfect catch,” explains Hawli. The same thought process resonates at TestPoint, where the right people, right team, tools, and solutions complement and augment the capabilities to bring about great outcomes for their customers. “We are seeing an increase in the demand from organizations to acquire consultancy services with a robust project delivery solution to address their business challenges associated with delivery, reporting, traceability, automation and testing. Our key differentiator is our Vansah™ platform solution and methodology provided to our clients right from concept to launch,” affirms Hawli. TestPoint’s unique Vansah™ Synthetic Application Monitor- ing (VSAM ™) solution provides a detailed low-level analysis of business transactions on both pre- and post-application releases including configuration level changes. VSAM™ captures performance benchmark metrics of the applications and provides a true end-user experience report with video recordings detailing the business transactions. The metrics reveal the slightest impact of how each change or feature performs based on builds, integrated test environments, and configuration details facilitating clients to investigate and resolve an issue early on. “We have seen companies pay in excess of a few hundred thousand dollars to attain similar metrics that hardly support a few applications. With TestPoint, our customers are saving in transaction and software fees and, most importantly, bringing capability and facts to the next team meeting,” says Hawli. For customers who may have invested valuable time into automated testing using a variety of scripts or tools, VSAM™ greatly improves the ROI by effortlessly integrating with existing scripts, supporting quality assurance and performance testing objectives. The ability to benchmark an application’s performance, availability, and user experience is helping TestPoint’s clients with important decision making regarding, data center relocation, application virtualization, physical server upgrades, or investment in new infrastructure technology. TestPoint was recognized as the ‘Clever Technology Partner’ by a large financial services provider for successfully relocating their data center within a non-negotiable cut-over period. Starting with a careful and detailed discovery analysis prior to migration, the existing application transactions including the inter-dependencies between business functions were captured using Vansah™. “We made a significant contribution through our VSAM™ solution which verified and justified the impact of each infrastructure and application level change. The key insights and facts helped the client finalize on critical decisions and also initiate remedial measures,” says Hawli. TestPoint recently introduced a service known as Vansah™ Tag Cloud (VTAG™) to help organisations manage their change impact. The data intelligence service, VTAG™, scans content within documents, attachments, incidents, and test cases the moment they are created or updated. Its ability to index keywords in real time provides meaningful traceability between business processes, requirements, and testing. VTAG™ identifies the keywords used both from an industry standard and from what may be specific to the client’s internal reference. “We now have the ability to locate detailed information and provide a 360 degree overview of the exact business process around a customer interaction. We see this as our big data solution to the industry. Having access to this information allows our consultants to accelerate insights, impact, thought leadership, better planning and communication with our clients,” says Hawli. TestPoint also addresses IP retention and management that continues to be a critical area for our clients. In a scenario where there is a lack of documentation, poor handover processes, and dependency on subject matter experts (SMEs), acquiring information to support the business is a real challenge. TestPoint eliminates the dependency on SMEs by systemizing IP through its VTAG™ technology, ensuring IP is retained, easily accessible and extensible, with a shortened ramp up period. “By creating and managing IP, we become the SMEs and an invaluable partner to our clients, providing insights and influencing outcomes that align with organizational and business goals,” says Hawli. The team at TestPoint continuously reviews processes to simplify, automate and innovate to support new projects and client requirements. “This requires a high level of collaboration and it stands as a testament to the Vansah™ platform becoming our consulting backbone, delivering excellent value across product development, QA, and testing,” says Hawli. This excellence is a culmination of TestPoint’s experience across a range of successful customer engagements with development and testing efforts underway to address large scale implementations. Not resting on the laurels achieved over the last eight years, TestPoint continues to grow its footprint in Australia and beyond. “Our focus is to provide unparalleled options to our clients to meet their organizational goals and vision,” states Hawli.